The 2017 ATA Trade Show at the Indiana Convention Center was one for the books for the Summit Treestands Team. The buzz from last year’s safety harness line lingered still, bringing more traffic to Summit’s booth than ever before. Adding to the hot commodity of the Pro-Harness series, we introduced our harness accessories; the Phone Pouch, small and large Utility Bags, Tool Pouch and Harness Storage Pack. All accessories are designed to attach to the MOLLE system on your Pro Harness. The Summit Team also created quite a buzz over the new and improved tree stand accessories. The Deluxe Front Storage Bag and Side Bags are redesigned to hold their shape, ensuring you find your gear quickly and quietly. Customers in search of the perfect upgrade for their stands raved about the new Deluxe Arm Pads. The innovative design includes additional padding, upgraded zippers and hooks to keep accessories right where you want them. 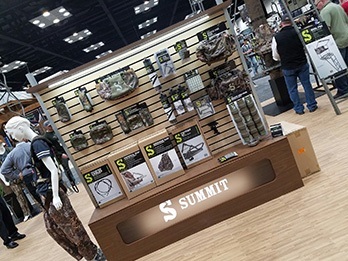 Summit’s 2016 Pro Series tree stands, the Hex and the Vine Series were once again a hot topic for the second-straight year at the ATA show. The Hex towered above onlookers with its imposing 21-foot height and rock-solid stability. The Vine Series unique, curved-ladder design drew spectator attention all week. “Engineered concealment” in the Vine Series keeps the stand broken up against wooded backdrops, while pencil rod tubing draws inspiration from suspension bridges for maximum stability. Both the Hex and Vine Ladders are staged to be perennial favorites among ladder stand fans.